Location/ Directions: Traveling on I-80/90: Exit at US 250 north, Exit #118. 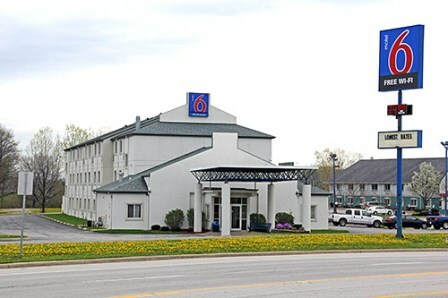 Travel north on US 250 to the Motel 6. About Hotel: 3-Floors, 63-Rooms, Interior Corridors, 32" LCD TV with AV connection for gaming, Free Wi-Fi, Free Local Calls, Free Morning Coffee, Free Expanded Cable, Kids Stay Free, Pet Allowed (View Policy), Coin Laundry, Elevator, Outdoor Pool, Truck Parking. Rooms remodeled in 2011. Railroad View: Excellent View! Any room on the south side of the motel will provide a clear railroad view. 2nd & 3rd floors will keep you above the parking lot. At night you can easily see the trains, but don't expect to be able to read engine numbers on passing trains. Windows do open, protected by a screen. Trains do not blow their horn, but its easy to hear them passing. Railroads past Hotel: Norfolk Southern (Line runs between Bellevue and Cleveland, not a very busy line, expect around 10-12 trains during a 24-hour period. Photo Comment: Photos taken from room # 204 show a eastbound auto-rack train passing through Milan. Photo on the left shows the Days Inn motel located right next to the tracks, but due to a sound wall, only a about 8-10 room will offer a railroad view. Right hand photo shows the complete railroad view from Motel 6. At night there is enough light to see passing train's, video will work fine as well, day or night. Location/ Directions: Traveling on I-80/90: Exit at US 250 north, Exit #118. Travel north on US 250 to the Days Inn. About Hotel: 2-Floors, Interior Corridors, Free Daybreak Breakfast, Gym/Fitness Center, Pool, Truck/Bus Parking, Indoor Heated Pool, Hot Tub, Guest Laundry, Game Room, Hair Dryers, 25 Inch TV's, 4 HBO Channels, Alarm Clock Radios. Railroad View: Excellent Westward View! Once the motel with the best railroad view in Milan, the owners built a wall behind the motel that prevents a direct view of passing trains. Now less then 12 rooms will even offer a railroad view. Rooms that face the tracks directly will NOT have a railroad view. You need a room on the west side of the building facing Route US-250 (Milan Road) in order to have a railroad view. These rooms consist of both double's and King rooms. Either floor will be fine for a railroad view. building are the "West Side Rooms", you need a room on the west side to see trains from this motel. All other rooms facing the railroad do not have a railroad view. Left photo (above): Due to a sound wall along the railroad, the only view are the rooms that overlook the overpass. This photo take from the rear parking lot shows both the railroad & the overpass. Lower Right Photo: A photo taken from a room in Motel 6 shows a passing auto-rack train passing Motel 6. All rooms on the south side of Motel 6 do provide a railroad, its just not as close as Days Inn. Location/ Directions: From 80/90(Ohio turnpike): Take exit 118, after toll go right toward Sandusky, hotel is on your right and entrance is located 1,000 feet past the building, use access road to travel back towards hotel. About Hotel: 4-Floors, 70-Rooms, Interior Corridors, Business Center, Easy to Set Alarm Clock Radio, Ergonomic Desk Chair, LCD Flat Panel TV, Cribs, High chairs, Coin Laundry, Elevators, On-Site Convenience Store, Fitness Room, Pool, Coffee Maker, Free Hot Breakfast, Hairdryer, Free High Speed Internet, Iron/Ironing Board, Lap Desk, Microwave, Mini Refrigerator, Newspaper M-F (USA Today), No Pets Allowed. Railroad View: Excellent View! Any room on the north side of the motel will offer a clear railroad view. Higher floor rooms are best. Binoculars are best to read locomotive numbers. Train horns are not heard from the hotel, the only train noise you will hear from the hotel is a faint rumble. You can see trains at night, low light video may work for recording after dark. Comments: Brand new hotel, Hampton Inn moved from a smaller 2-story building next door. Photo Comments: Looking northeast from room # 420, a Norfolk Southern Railway double stack train is seen. Even with the uncut corn stalks, it was easy to view most of the train as it pulls into the distance. Lighting is best for pictures during the AM hours to as late as mid-afternoon before the sun swings onto the other side of the tracks. Second from top: Three Norfolk Southern locomotives pull a westbound train pas the hotel. The zoom lens is open to 69mm in this photograph from room # 420. The 4th floor is great for viewing the trains, although you should get a great view from any room on any floor on the north side of the building. Night Photo: Using an 18mm lens, an auto-rack train came to a stop long enough to grab some night time shots. There is enough light along to railroad to view passing trains. A view from the parking lot: Just as I was packing up the car to drive away, a double stack train past the hotel. Although I missed snapping a photo of the locomotives I was able to get a shot of the train. As you can see, even rooms on the first floor will offer a railroad view, as long as you don't have too many vehicles obstructing the view. RailfanMotels.com - Visited October 2014, Reviewed April 2015.